Flora Elements Education and Floral Studio are opening its doors to the Delafield, WI community. They are a small business that is focusing on education and modern floral design. Flora Elements Education and Floral Studio offers a full service florist and delivery to all Lake Country cities and surrounding areas. 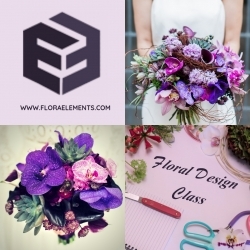 Delafield, WI, January 21, 2019 --(PR.com)-- Flora Elements Education and Floral Studio opened its doors to the Delafield community and beyond. Flora Elements is a Florist offering modern floral designs, custom bridal bouquets, and wedding arrangements to local Lake Country, Waukesha, Pewaukee and Brookfiled. Their main purpose is education - they offer a certification Floral Design Class, but also many fun classes for those who are not florists and just need to relax and play with flowers. Lisa Belisle AIFD, the owner of Flora Elements, has twenty plus years of experience in the floral industry and is excited to bring all her knowledge and innovative ideas to a retail space that allows her work closely with students. Lisa’s passion for creativity has no bounds. She is consistently looking for community partners and artists to collaborate with to bring flowers in to all areas. Flora Elements will be hosting their Grand Opening on February 22nd 3-8 pm and February 23rd 10-2 pm 2019. They are among the Cushing Park Businesses and look forward to meeting all of our community.